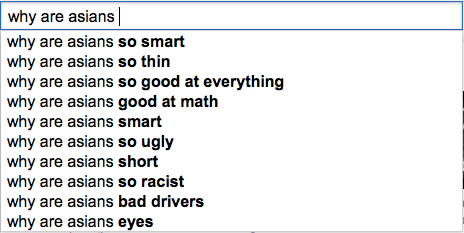 Here are some interesting Youtube search suggestions for different races/nationalities in alphabetical order. 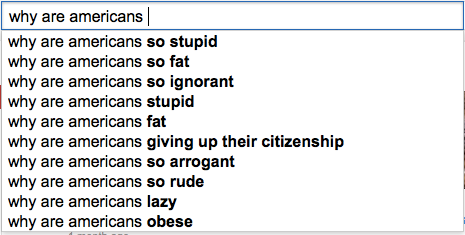 I wasn't aware that Americans were giving up their citizenship. Both so hot and ugly. 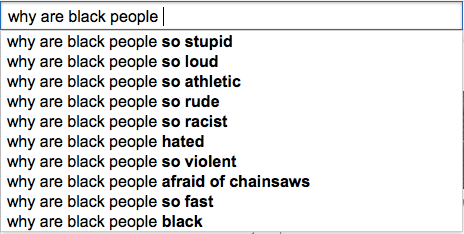 Americans aren't afraid of the dark. USA! USA! Obsessed with fairness? Maybe I should look up ndtv. I'm surprised that there aren't more suggestions. Can you be racist BECAUSE you're scared of black people? I have lived in St. Louis for two and a half months now and I can finally say that it feels like a second home. I have a nice, cozy studio apartment located in a relatively nice neighborhood close to school. All of my classes have been both challenging and interesting. And I have made quite a few friends here through the various activities that I have taken up. First the apartment. My place is on the third floor of this apartment building that was built in the 1920s, I believe. There is no central heating, but I do have a window unit. All the utilities except electricity are included in the rent, and the rent itself is not too high for this area. Since I am going to be here for about six years, I decided to buy real furniture for the first time in my life. I have a couch and two accent chairs. The kitchen is a decent size, but I do not have a lot of counter space, which is bad. Regarding the surrounding areas, I live about one mile away from school, which is extremely convenient because it is within biking and walking distance. The grocery store is about half a mile away, which is farther than I would like it to be, but extremely easy to get to with a bicycle. (Speaking of my bicycle, I bought one within the first two weeks of arriving here, and I managed to tie a milk crate onto the back of it. It has been extremely useful in carrying groceries.) The neighborhood that I live in is called the Central West End and it is filled with random shops and restaurants. There is also a light rail/subway station within walking distance, which is really nice even though the public transportation here is not that good. The unfortunate part of my neighborhood is that there is no large department store. In order to buy clothes, appliances, or furniture, I have to take the subway to Target or ask a friend for a ride. Most people here have cars as St. Louis is a driving city. In that sense, it is like a tiny Los Angeles. Regarding schoolwork, the typical student course load here is three per semester. Currently, I am taking Kant, Hegel, and Aristotle. I have never done any Hegel before so I am very happy that I am being exposed to new material. I just wish that Hegel were easier to understand. He writes with such odd vocabulary that it is difficult for anyone who does not specialize in Hegel to actually understand him. Because of this, he is probably the most difficult philosopher that I have ever encountered. Regarding Kant and Aristotle, I have always read the work of people who have been influenced by them, but never their work directly. I am very glad that I am familiarizing myself with these famous philosophers. The more I learn about them, the more I realize why they are so widely read. A couple of things regarding the philosophy department. First, St. Louis University (SLU) is not known for its political philosophy. In fact, I am the only political philosopher of my class of seven people. Second, being that SLU is Catholic, there is a strong religious presence here, especially in my department. The chair is actually a priest and I am the only one in my class who has no religion. (I am also the only Asian.) So in couple of ways, I am in the minority. That said, I have felt very welcomed ever since I arrived. I do not feel like I have been ostracized at all because of my beliefs. Regarding my extracurricular activities, I have only great things to say. Before I even moved here, I told myself that I had to take improv and lindy hop classes. I am happy to say that I followed through with those plans and that they have brought so much joy into my life. It is difficult to express how much fun both of those activities are and how nice it is to be able to meet new, nice people. After doing philosophy all day, it is very satisfying to engage in an activity that is challenging in a completely different way that academia is while also being relaxing. I feel like I am developing myself in a myriad of ways and thereby living a more flourishing human life. In other news, I am also happy to say that I recently came back from presenting a paper at a conference in Florida. The conference was hosted at the University of Tampa and was organized by this one philosopher who started this blog that I participate in. My paper was about Iris Marion Young's model of oppression and the feedback I got was quite helpful. I hope to be able to publish this paper and give myself a head start in the world of academia. What was also very nice about going to this conference was that it was mostly paid for by the school. Graduate students can get funding both from the department and from the Graduate Student Association. But due to their limited funding, they can really only cover the expenses of one trip per year, which is still nice. All in all, I am very happy that I got the privilege to study here. The fact that I am getting a stipend to read, think, and write philosophy is wonderful. I cannot wait until next year when I start to teach Introduction to Philosophy. There will be a room full of freshman who are ready to take their first steps!